We are a group of university professors in a Center that understands that the production of knowledge should be oriented to the critical transformation of social reality. 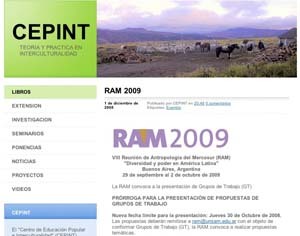 Its name is Center for Popular Education and Interculturality (CEPINT). During the last 10 years we have been doing research and extension in conjunction with various kinds of organizations, especially of indigenous people. As scholars teaching anthropology and methodology, we focus on the articulations between alternative epistemological viewpoints and performative practices of inquiry. This web site´s goal is to produce an space for exchage and dissemination, both of academic and political activities as of our own perspectives and productions.